A: It doesn't look like an ignition switch connector to me. Anti-theft?? 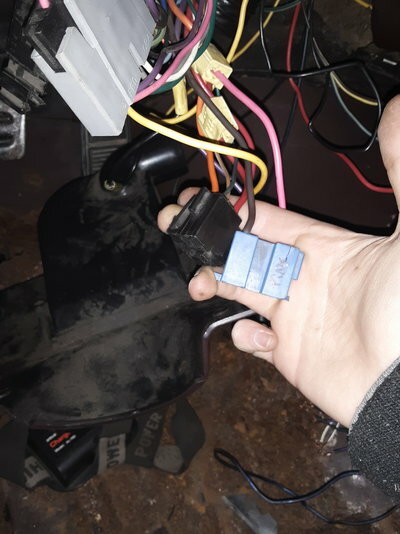 I pulled the blue connector out of the steering column along with the small black one the same size I saw the red/purple/pink wires and started going at it there. Are the scotch lock connectors the yellow blocks attached to the wires? Maybe not a good angle for me to see. Yes those are the scotch locks. 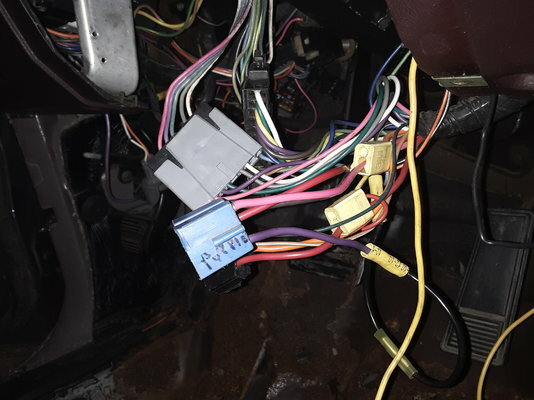 Have you tried another ignition switch and just plugging it in to see what you have? To answer your question: pink is ignition (gauges) and orange and brown are accessory (radio). I just did my ignition switch....unbolt the steering column, let it drop down and do the switch from the top instead of up from bottom. Thanks for reminding me the colors I drew a blank for some reason on which wires which . Also I'm not going to mess with those scotchlocks I'm not trying to solder under my dash my soldering iron is a piece of crap lol . Why install a secondary switch that can cause other issues and potentially be a safety problem?